It's just a week before Mother's day, let us have the privilege of greeting you and your mother a Happy Mother's Day and to all mothers out there, and to celebrate this momentous occasion to the most important women of our lives. King Chef Seafood Restaurant ushers in a feast for the senses, for the "Light Beacon" of the family a special set menu for a family of 6, the whole family will surely enjoy. King Chef Seafood Restaurant features 2 Mother's Day Set Menus to choose from, whether you fancy Peking Duck or Beef Brisket, they have it all for you. First up, 4 Kinds Cold Cuts Platter with Beef Kenchi, Roast Duck, Pork Asado, Soy Chicken, Century Egg and Seaweeds to start the feast. The Platter itself is already a complete meal in one, just bring on a cup of steamed white rice, and we're good to go haha, but we're just getting started. Our taste buds turn to King's Special Crabroe Soup, King Chef's specialty soup featuring fresh seafoods with a dash of Crabroe to liven up the senses. The Mixed Seafoods with Broccoli, is a welcome balance to our meals, with fish fillet, squid, shrimps and brocolli, I could not have anything less than this, so fresh and so invigorating. Steamed Pampano in Dried Salted Yellow Beans (Taoso), is one of the best Fish dishes I have in a quite some time, I love pampano as always, but topped with taoso, now that's even better. Light salted compared to black beans, this steamed Pampano will be finished in no time, try it to believe. Finish it up with Yang Chow Fried Rice, for a full meal experience, that is if you still have room. 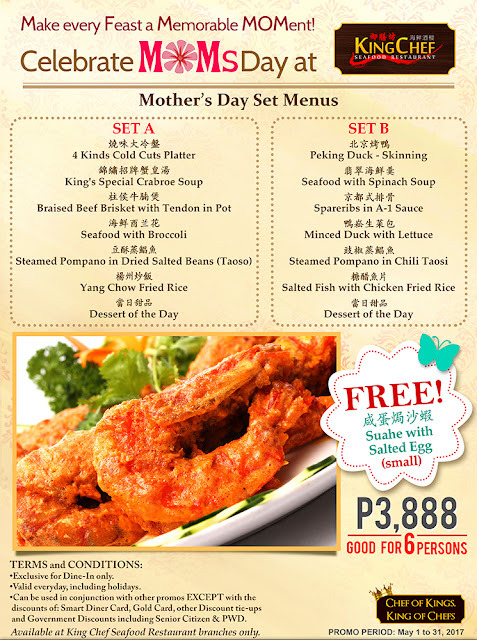 Get to enjoy these Mother's Day Set Menus for only P3,888 per set, good for 6 persons at King Chef Seafoods Restaurant in Quezon City and in Lucky Chinatown in Manila. Give your "Mom" and your family the best Mother's Day ever! 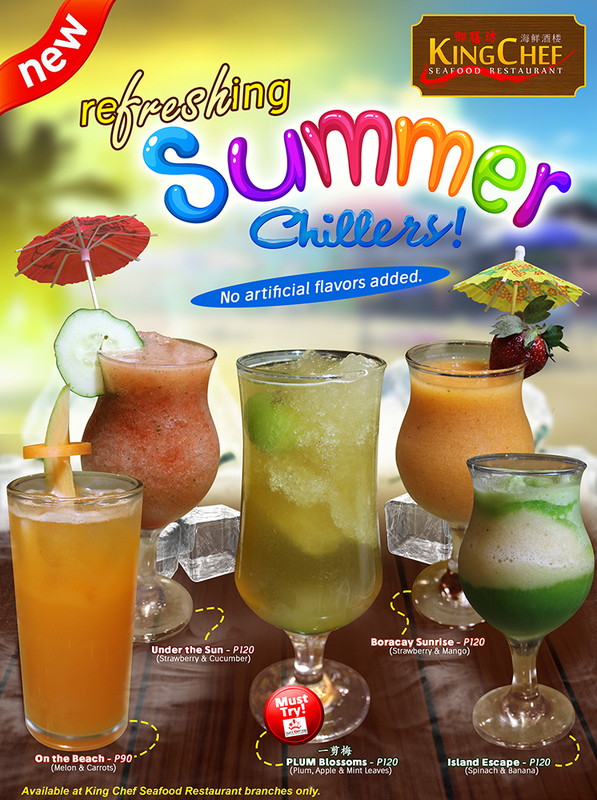 And while enjoying your Mother's Day Menu, pair it with King Chef's Summer Chillers sure to lighten up your mood. Come visit King Chef Seafood Restaurant and have a wonderful Mother's Day feast for the whole family. This offer is available for the whole month of May, so if you want to celebrate early or can't wait in line for Mother's day itself, you have a whole month to celebrate it. Here's to our Mothers! Thank you for being the selfless, most patient and most loving mother for us.